Village man in India submitted to ‘Quiet Moments’ on National Geographic. Kristian Bertel has contributed to the National Geographic Your Shot community with an assignment called ‘Quiet Moments‘. For this assignment curated by David Y. Lee, a producer at Nat Geo Your Shot he was inspired to curate an assignment focused around a theme of quiet moments. As David is saying it: ”- You may not be able to articulate what makes a quiet photo, but you can feel it. Your reaction is different from that toward an epic photo. Quiet can command your attention through subtle cues that others might miss. Show us photos from when you documented, witnessed, or enjoyed quiet moments, and then share the stories about your experiences. While you can submit photos from your archives, I highly encourage you to set aside some time to take new photos that are quiet. Notice how you move differently when you’re respecting the quiet moment you’re documenting, trying not to disturb the world in front of your camera. Use this assignment to not only take pictures of quiet moments, but to also quiet your mind as you work. I encourage you to slow down, take a deep breath, and be in the moment as a photographer”, he says. Quietness in spirituality is often a metaphor for inner quietness. A quint mind, freed from the onslaught of thoughts and thought patterns, is both a goal and an important step in spiritual development. Such “inner quietness” is not about the absence of sound, instead, it is understood to bring one in contact with the divine, the ultimate reality, or one’s own true self, one’s divine nature. Many religious traditions imply the importance of being quiet and still in mind and spirit for transformative and integral spiritual growth to occur. There is the silence of contemplative prayer such as centering prayer and meditation and there are the wisdom writings of the Sufis who insist on the importance of finding quietness within. Quietness and allowing the mind to become silent are implied as a feature of spiritual enlightenment. In Hinduism, including the teachings of Advaita Vedanta and the many paths of yoga, teachers insist on the importance of quietness, Mauna, for inner growth. 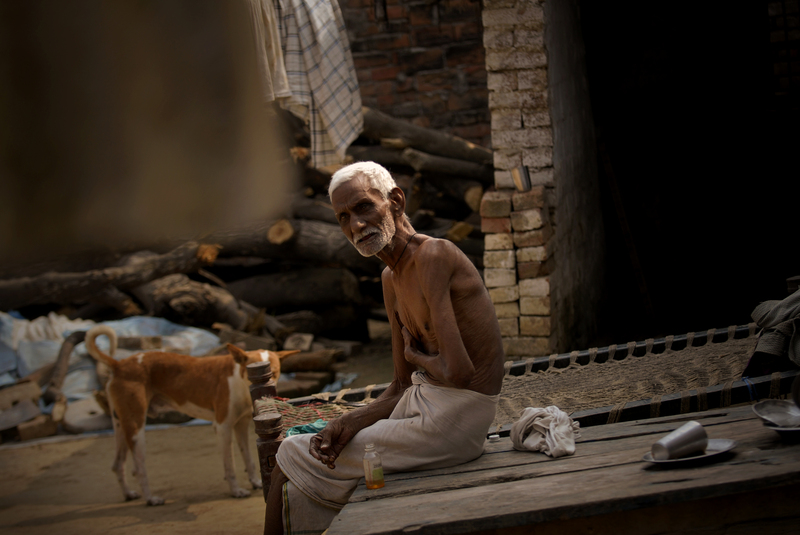 ”- With my photograph I want to take this assignment into the quiet moments of the villages in India. The life of villages are often described by the way villagers happily live quietly in the small huts or a home made by clay or mud. Through generations these villagers are socially knit together and every evening they assemble in the village ‘Chopal‘ with their ‘Hukkas‘ and chatting and talking goes on until late in the night. However, there are no water supply, no indoor toilets and no electricity. River water, well or hand pump are the main source of water”, the photographer Kristian Bertel says.